Your child spills her cup of milk at dinner. She wasn’t being bad. It certainly wasn’t malicious. But she was a child who was being…childish. Not quite paying attention. Acting a little clumsy, a little distracted, and a little too caught up in being silly and not paying enough attention to the distance between her hand and the cup on the dinner table. You know…this is how accidents happen. We make mistakes. Sigh. Big. Maybe roll your eyes. Make a big body language statement about how fed up you are with childish behavior. Lecture. Give a grand ol’ parental speech about paying attention, maybe even covering topics such as physics, human behavior, and child psychology. Yell. Call the child names and shame them. Place your hand on their back gently as you hand them some paper towels and whisper the reminder that mistakes happen. Me? I’m generally a lecturer. In fact, my speeches take on a life of their own at times. I know I should stop lecturing my child and driving home deep life lessons at such a moment, but it’s like I just cannot stop my tongue and hush my mouth up already. I’ve been reading and re-reading this story about Martha, grumbling and complaining in the kitchen and then running to Jesus to tattle-tale about her sister, Mary. Maybe during the summer months when my own kids are devolving into spats and squabbles and then come running to me for judicial rulings, I’m totally interested in how Jesus responds to sisters fighting. First, I notice what He doesn’t do. He doesn’t heave His shoulders up and down in a big, audible sigh. He doesn’t roll His eyes or nonverbally scream that He’s oh-so-tired of Martha’s childish behavior. He doesn’t call her names. He doesn’t bully her, abuse her or lecture her. Jesus responds with tenderness. Right in the middle of her chaos and conflict, right where she is in sin and ugliness, right when you’d think she merited punishment or admonition , Jesus chooses the loving response instead. “Martha, Martha, you are anxious and troubled about many things” (Luke 10:41 ESV). Only then, after He’s gentle assured her of His attention and care, does He address the greater need of her heart. And then there’s Peter, of course, sitting with Jesus after His resurrection and likely feeling desperately afraid of what Jesus might do or say. Peter was the denier. The one who promised to stick by Jesus no matter what and the one who betrayed him at the earliest opportunity. How would Jesus react to Peter? Duck behind the aisles of Jerusalem’s Wal-Mart in order to avoid Him? Stop answering his phone calls? Would he yell or scream or turn away or belittle Peter, such a failure of a disciple? No, Jesus shares a breakfast of newly caught fish with Peter and over the crackling of a seaside bonfire, restores Peter and commissions him for leadership within the new church. Therefore the LORD longs to be gracious to you, And therefore He waits on high to have compassion on you… (Isaiah 30:18a ESV). He chooses to be gracious. He doesn’t give us what we deserve; He gives us compassion. Of course, it’s not natural. Annoyance and even anger are natural. When someone else fails, we can default to what’s natural or we can choose what is Jesus. As a mom, a wife, a friend, a woman….I want to choose Jesus, not just when it’s easy, but when the pressure is on. When my heart is racing, when I’m hurt, when I’m annoyed or even angry, choose Jesus. May my instant reaction, the one unfiltered by niceties and good Christian girl facades, be deep-down compassion and grace. Remaining tender during a trial is one of the most powerful ways to build an intimate relationship (Love is a Decision). At the moment of vulnerability, and particularly in the midst of the crisis itself, what a person needs first is tenderness (Love is a Decision). Character-training can come later. Loving boundaries or correction can come later, quietly, privately, gently. There’ll be plenty of time for that. But right there when there’s mess all around and their heart is hurting, people need tender mercy not condemnation. So, I can build up relational walls and spout off words I’ll later regret, or I can reach out a gentle hand, place it on the small of their back and take the tenderness challenge by learning how to love others like Jesus loves me. Put on then, as God’s chosen ones, holy and beloved, compassionate hearts, kindness, humility, meekness, and patience (Colossians 3:12 ESV). 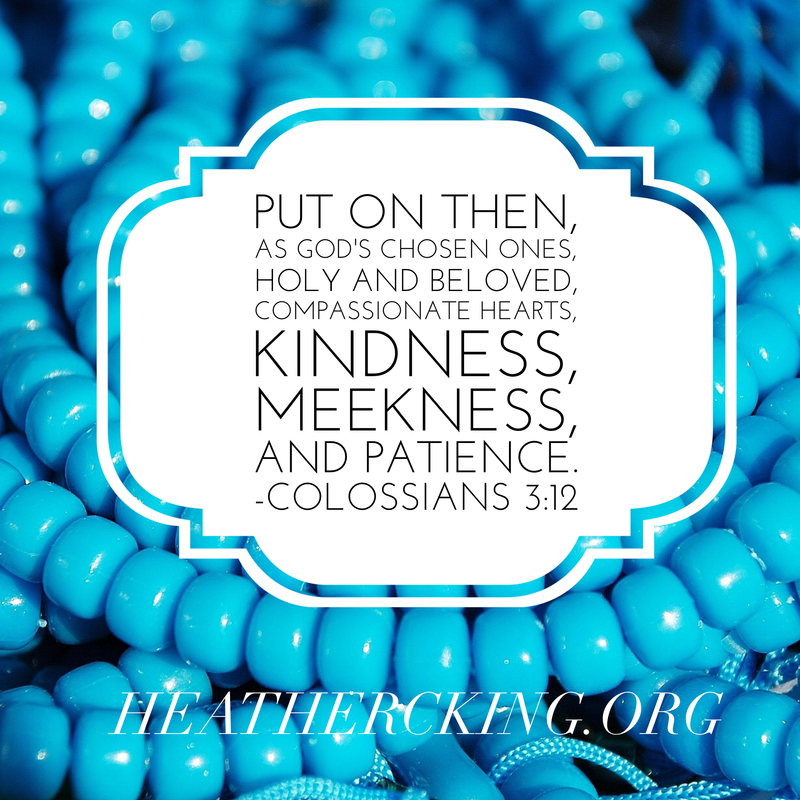 Oh, Heather, how I needed this devotional, especially when dealing with my grandchildren! They are so blessed to have you as their grandmother!! !